Alexander Graham Bell patented the telephone in 1876, initially referring to it as a “talking telegraph.” The New England Telegraph and Telephone Co. extended its lines to Ipswich and instituted the telephone exchange in 1897. In 1954 the telephone service in Ipswich was changed from the traditional operator system to the dial system. The telephone exchange was in the Tyler building at the corner of Central and Market Streets. The “Hello Girls” above are photographed with the district manager, and include Evette Conley (left), unknown, Kay Lang, supervisor Dorothy Sinclair (standing), Stacia Haley, Dorothy Bowen, Florence Femino, and Arlene Robbins. Photo by Peter Zaharis. It was sort of a sad year in 1954 when the telephone service in Ipswich was changed from the traditional operator system (Hello Girls) to the dial system. Although in many ways the dial system is an improvement over the old method of direct contact with the telephone operator, there is still a lot to be said for the former type of service. Many times when a person had to wait a few seconds for the operator to say, “Number please,” the caller would become impatient and sometimes abusive, particularly during the busy hours. But if this person had ever had the experience of being in a telephone office during a busy period, as I had many times, he or she might have been a little more patient. My family was more or less a telephone family. My father, two brothers and a sister-in-Iaw were all telephone operators. Many times the same persons who criticized the telephone services were the first ones to ask for a favor. They would call the operator for the time of day, or a certain number when they didn’t want to bother to look it up, or even ask the operator to call them at a certain time in the morning so they could catch a train. Most of my family were night operators. And I can still visualize today the list of clammers who had asked to be called when there was early morning tide. How many times the operators were called when there was a fire or police emergency. They were asked: “Where is the fire?” or “Is there an accident–I just heard a siren?” The operators were even asked if they knew where a certain person was because he or she did not answer the telephone. How many times an operator would be asked by a fellow to tear up a ticket because he had talked an hour on the phone to his girl out-of-town. How many times has an operator been asked to return a dime at a pay station because the caller knew the operator. More than one person’s life has been saved because an operator saw the light burning on the switchboard and knew the phone was off the hook. Police were sent to the home and many times found a person had fallen or was having a stroke. Sitting in a hot telephone office all day long answering calls was no picnic. In those days there was no air-conditioning. The dial system is quicker and more efficient, but it still cannot compare with that personal touch you had with the Hello Girls. 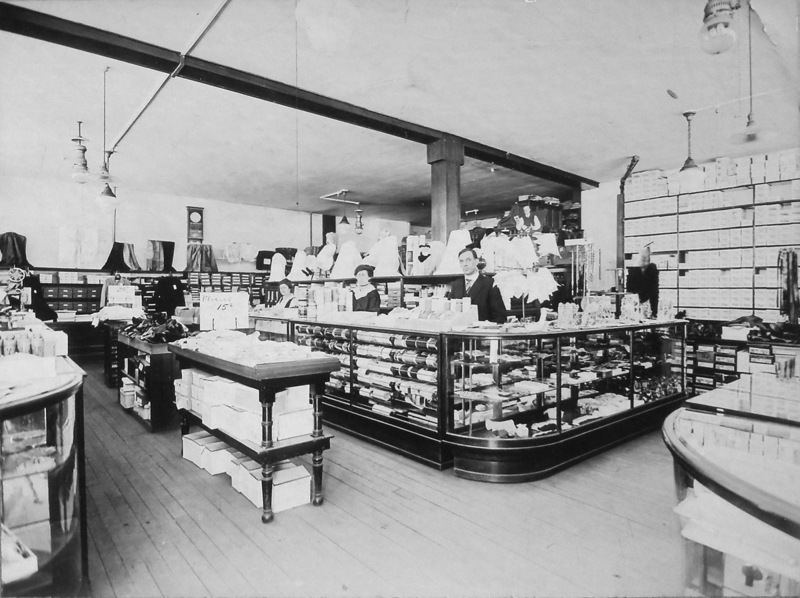 Downstairs was Tyler’s Department Store. Great story and so true I remember those days so well. Something these new kids will never have have. I do love the new phone system but love remembering how it started out. Boy do I sound like an old lady .. Lol. Gordon, what a charming story about the finale of switchboard service in Ipswich. You would wonder where all these folks found work afterwards. Just the beginning of downsizing as a result of technology, I guess. Looking at the old Lynnfield Town Reports, I read that switchboard service was replaced by direct dial in 1951. I am sure the same circumstances applied. Just imagine what these operators knew about EVERYONE’S business in town! Great pic of the operators too.